Q: (k4pt41nk4ng4r00) Why isn’t the Excalibur/Vesper/Exeter in the Fleet Store? Dstahl: As we prepared to release Season 6, we were looking at what ships to make available in the Fleet Store. The designers settled on 40 ships, divided between FED/KDF, which gave a variety of options at Season 6 launch. Our intention is to continue to add more in future Seasons and updates. One reason why a ship might have been chosen for the first release is whether or not the ship had a console that could be moved to the Fleet Ship. Another consideration was whether or not the ship had a T5 C-Store version. We appreciate that everyone has a favorite ship and we continue to add ships to the game at a very solid pace. Q: (russel1997) What is the state of PvP in STO? Dstahl: My personal opinion is that PvP has never been a strong suit of STO or of Cryptic Studios in the past. Over the last year, the studio has been coming to terms with this and has dedicated internal development resources to analyzing and building a fun PvP prototype. This has helped us learn and understand the tech necessary to make PvP a healthy part of our games. That effort was largely successful internally and helped identify how we should proceed with PvP in the future. 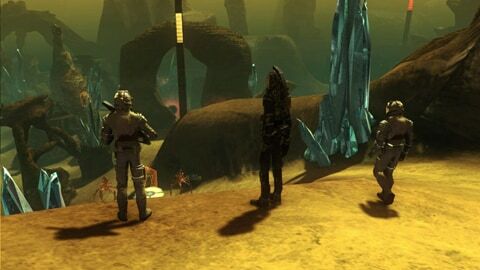 Earlier this year, STO jumped at the opportunity to be the first Live Cryptic game to use this new tech and started work on revamping a space PvP map that could serve as a test bed for players to provide feedback. That test map was nearly finished when “Gozer” left the team. It has since passed to another designer on the team and he is coming up to speed on everything that had been developed over the past several months. At this point, we do not feel that rushing something out right away is going to help. In order to improve PvP for the players who currently do like it, it will need more extensive testing time than we’ve typically allowed in the past. The first step is going to be putting a test map out for players sometime in the next few months and then seeing where we go from there. Only after we believe the existing PvP community confirms our opinion that this is an improvement to PvP, will we consider putting serious development effort towards a releasable map set. Thus, the writing on the wall is that PvP will continue as is for the duration of Season 6 and will slowly begin to improve in Seasons 7 through 9, with the end goal of having an awesome and fun PvP “battleground” like map by the time Season 9 ships. Not exactly the best news if you are waiting for new PvP maps, but at least it gives a clear view of what we are doing. Q: (chalpen) In the previous Ask Cryptic you mentioned a new way of delivering storied content. Could you elaborate? Dstahl: A criticism of our most recent Seasons is that they have been systems heavy where some players would prefer them to be more content driven. While systems such as Duty Officers and Fleet Advancement were often requested and necessary improvements to the game, it has been a while a since we’ve expanded on the plots that comprise the story of the game. Last February we released the Dominion Featured Episode series focused on the role the Dominion is playing in our timeline. For Season 7, which we expect to release before the end of the year, we will be expanding the playable zones in our game by adding a new sector block located between the Klingon and Romulan neutral zones. Unlike a Featured Episode series, where missions are added week over week, this Sector Block will have some content available when Season 7 releases and other content that appears over time. The sector will include a primary story that will be conveyed through a large new planetary zone, new planets to visit, a new Fleet Holding, new queued missions, and a new personal reputation system. All of this will center around a plot introduced in previous episodes. Q: (wildthyme467989) Are there plans afoot to add Fleet Marks or Dilithium to the Borg Invasion on the planet Defera? Dstahl: Now that we are opening up full-time access to the Defera Invasion zone, we plan to add Fleet Marks as a reward to all missions on both Defera and Nukara Prime. This change will include a bonus if those missions are turned in during the Fleet Hours Event. It also means that we will be slightly adjusting the amount of Fleet Marks given out by these missions, as well as keeping the recently added cooldowns on the missions to prevent easy Fleet Mark exploits. In addition, we also are looking at adding Fleet Marks to additional missions and generally balancing the amount of Fleet Marks given out by all Fleet Queues. One additional source of Fleet Marks will be a way to earn Fleet Marks by playing Foundry missions. Look for these changes to be released in updates over the next several weeks. While we don’t have plans to add Dilithium rewards to Defera, we will be introducing a new way to earn raw Dilithium within the next two months. These updates may also include Fleet Marks for PvP. Q: (stostargatewars) Any update on the Vesta? Dstahl: We’re happy to announce that we are working with Mark Rademaker to get the Vesta class ship into STO. We'll talk more about the Vesta closer to its release date. Q: (mewi) Do you yet have a release date for a character re-trait option? Also will you add cat ears, cat tails, and body style tattoos/spots/stripes/ect to alien/character options? Dstahl: We appreciate that many characters may wish to change their previous species choice and/or trait choices, and we want to add a feature to allow these changes to be made. However, but we are still a few months away from nailing this down. In regards to adding more options to “alien character” options, we need to balance the options reserved for the premium Caitian/Ferasan species with what is readily available for all species. That said, there might be some wiggle room to add a few things. In related good news, we are happy to welcome Senior Character Artist Steven Ekholm to STO, who is joining our team from 38 Studios. His talents will be put to great use adding new customization options to STO characters in future updates. Q: (wry1) Can we get more endgame content that utilizes our ground Bridge Officers? It’s such a shame we’ve spent time developing them and hardly get to use them. Dstahl: We agree and plan to address it adding some ground missions that allow players to utilize their highly trained and well-equipped bridge officers. There was a forum posts that suggested making single player or co-op versions of ground STFs. There are several interesting options we could pursue. Whatever the final solution, we acknowledge that we need more Bridge Officer play at end game. Q: (framesplicerx) When will we get UI COLOR customization so I can finally play KDF with my IRL friends? They find the intense red UI extremely tough to view. Dstahl: The UI team is looking at the HUD UI now to review and implement a better way to customize the UI. This may include color templates as well as an easier way to reposition trays and UI elements than the current system. There is no release date for this yet, but they are actively discussing upcoming changes such as this. Q: (sc0ttish) Is there any progress on merging the sectors into one big happy one? Dstahl: This was an awesome idea, but we have yet to identify a way to do it in a reasonable amount of time. Given that all of the existing missions and episodes in the game would have to be edited in order to ensure that you end up where you need to go, it is an idea that sounds excellent, but is problematic to implement. For the time being, we will continue with the current structure and even add new sectors. In the long term, if we ever open up another part of the galaxy map (such as the Delta or Gamma Quadrants), we are considering taking this approach since we will be able to build it from scratch and not need to change existing content. For now, the sectors are going to stay along with some minor restructuring and general layout improvement in Season 7. Q: (lordmalak1) Are there any plans to introduce true T5 ships for the KDF, or at least allow owners of lower tier KDF c-store ships to enjoy the Fleet Ship upgrade discount that fed T5 ship owners get? Dstahl: Not all ships receive discounts. The philosophy on which ships receive discounts is related to whether or not the “benefit” or defining feature of a C-Store ship makes it a unique variant. For example, if a Tier-5 C-Store ship comes with a console that gives it a special ability, we offer a discount on the Fleet Ship variant because it doesn’t come with the console that is sold in the C-Store. The console can be removed from the C-Store ship and placed in the Fleet Ship, so you might want to own both ships. The Fleet Ship by itself can be purchased as a stand-alone ship and be viable. However, if you want the Tier-5 C-Store sip console on the Fleet Ship, you must purchase the C-Store variant, and this is why we offer a discount for those who want to own both. If you then take a ship like the Guramba Siege Destroyer, which comes with a transformational power instead of a console, then it becomes odd to create a Fleet Store variant because it would essentially be the same thing as the C-Store Guramba, just with a few extra stats. If it came with the transformation power which defines it as a Guramba, then why bother with ever buying the C-store version? Essentially, some ships have discounts and others don’t because we consider the C-Store and Fleet variants to be different enough that you may want to have both and can transfer the power of one into the other. Not many of the Klingon ships fit this criteria, which is why we are considering either alternate ways to either release more T5 KDF ships, or having a different rule set for ships like the Guramba and Excelsior, which have powers instead of consoles. Nothing has been decided yet, but we are discussing it internally. Q: (shauncoates23) Would it ever be possible to build an app for phones and/or tablets, that would allow us to manage our Duty Officers and their assignments? Dstahl: There are a ton of great opportunities to relay information from STO onto mobile devices and we have a special team at Cryptic Studios actively working on apps that could do this very thing. Stay tuned for future announcements regarding ways we intend to extend your STO experience onto those devices. Q: (blastenblaster1) When will past Lobi store items be put back? And when will Lobi crystals be tradable between different characters on an account? Dstahl: If you are looking for a chance to get the Ferengi items, they will be making a reappearance in a future update. The reason why Lobi crystals themselves cannot be traded between characters is because we offer all characters a chance to earn free Lobi and it would lead to an exploit. That said, most items purchased through the Lobi store are tradable. If we remove the option for each character to earn free Lobi, then we could consider making Lobi account bound. The conflict is that players are continually asking for ways to earn free Lobi. Q: (sirking417) Is there any hope for other factions like being able to play a Borg side? Will we ever be able to get a Borg ship? Dstahl: Playing as a Borg has been suggested before and would be fun to develop. If we were to introduce a new faction, we would most likely start with the Romulans. Q: (captain4merica) Can we please get a daily mission to replay the storyline episodes? Dstahl: There are a lot of great ideas posted in the forums about this. We have considered having episode replay leaderboards, but for now we will most likely start hooking up Fleet Marks to episode replay in the near future. If we can get to the leaderboard/episode challenge concept in the future, we will because we agree this would add some fun value to episode replay. Q: (asdfjkadfjkasf) Is there ever going to be a TNG skant uniform? And if so, would it be unisex like the one in the show? Dstahl: It almost happened for the TNG 25th anniversary, but we ended up doing the Season 1 uniform instead. If and when the skant arrives, it will be unisex. Q: (Kexx06782) Orions finally received a proper dreadnought model, will the Gorn be getting a new model as well? And, will the art team be able to go back and touch up models that have errors? Dstahl: Yes. This is done and in the process of being hooked up. It will be added to all enemy groups that feature the Gorn Dreadnaught. When it comes to touching up existing models, we are constantly doing this. The funny thing about this question is that, as far as we can tell, every Star Trek fan has a specific issue with a ship that they feel should be changed or fixed. Some fans know every little detail about every ship. As a game, we built all of our own starship models because we have performance considerations related to the geometry of the ships that would make using the original models impossible to render the way we do in STO space combat. That also means adding in as much detail as necessary while balancing the time we have and the accuracy needed. For game play purposes it isn’t nearly as much detail as what is needed for a beauty fly-by shot in a movie. That said, we are constantly trying to address fan feedback and edit costumes and ships in our game constantly. The original Galaxy Class ship alone has been edited for feedback over 25 times, each time adding more detail. So while we appreciate purists, we have to balance what is entirely accurate with what is good enough for the game. Q: (drkaczs) I run a small fleet. To make it fair, can smaller fleets get a bonus to earning fleet marks? Dstahl: Since the release of Starbases in Season 6, we are keeping a close eye on Fleet project progression and will be making some changes in upcoming updates. These changes include significantly reducing the amount of Fleet Marks needed at higher tiers, adding more missions that provide Fleet Marks, and adding a Fleet Mark Boost item that can be purchased for Fleet Credits. The Fleet Mark Boost item is intended to be more viable for small fleets where individual members have more Fleet Credits because they contribute more items per individual and earn more FC per member than large fleets, where contribution amounts and FC are more distributed. All of these changes should dramatically help smaller Fleets. Q: (robpivarnik) Love the account bank, but with all the new pets, consumables, and other goodies… any chance we old-timers can get a few more rows of bank slots… as a 1701-day veteran’s reward, perhaps? Dstahl: You won’t have to wait a couple more years to get more bank slots. We intend to continue offering account or regular bank slots as additional reward unlocks either through the veteran system, via future rank additions, or as a reward for completing other personal development systems in the future. We don’t expect the current caps on any type of slots to be the final caps. That also includes Ship slots, Foundry project slots, and pretty much any other type of slot in the game. Q: (barrington1982) Hats! Please can we have some hats! Even if they’re only available for off-duty uniforms, it would be a welcome addition. Who doesn’t want a nice trilby, fedora, or flat-cap to go with their pin-stripe suit? Please make this old man’s dream come true. Dstahl: This is a great request and something that hasn’t come up in a while. We’ve always wanted to have a Dixon Hill outfit, but if we go all out and do that, we have to add the Tommy Gun in as well. We’ll see if this fits onto one of our future release schedules because we love making dreams come true. Q: (Paulyman) I am particularly unhappy with what was done to Nukara. You guys seem to think our player base is larger and more active than what it is. If a small fleet has one or five dedicated players who commit 2 hours out of their day to do a repetitive grind for the good of their small fleet, what is the harm to the game? Dstahl: I'm assuming that this is in response to adding cooldown timers to the Nukara Prime missions. The reason we added them was to prevent an exploit that was harming the game. That said, we do appreciate that smaller fleets need more ways to earn Fleet Marks and are making changes such as those detailed in answers above to address this. We don’t need to “think” the player base is larger or more active because we have the benefit of knowing exactly how many people are playing, for how long, and how many Fleet Marks are being earned by each character and each Fleet. This allows us to make necessary changes based on real data for the good of everyone without having to make assumptions or guess at what needs to be done. Sometimes changes can be frustrating, but we are sensitive to all the concerns that different players with different play styles may have and do our best to approach issues with as much feedback and data as we can. Our goal is to make changes that will that the changes that are coming to help small fleets resolve the issue you are unhappy with, even if the changes were not what you expected. Q: (maxxina) re-done exchange in S7? Yes/No? Dstahl: Yes. Maybe soon. This is also true of the PVE Queue UI, and probably other UI elements as well. The very next UI updates we will be making are in relation to Fleet Project donations, where we plan to add the ability to donate multiple anomalies at once. Q: (vengefuldjinn) Will we ever see some of the design the Next Enterprise runner up ships introduced? Dstahl: Great question! The answer is yes! Obviously we can’t bill them as the “Enterprise,” but we are still fans of many of the ship designs that were sent in and we are going to be looking at them for inspiration for future Federation ship designs. There were some absolutely awesome ships that were submitted, and we feel it would be great for the community to get these into the game. Q: (tobar26th) Any news on “Into the Hive”? Dstahl: We had our first playtest last week. It is pretty awesome fighting the Borg Queen, but there were several elements leading up to the boss room that need some more work. Q: (wraithshadow13) when will skins and complexions make the change to full body? As of yet, they all either end awkwardly at the neck (infected) or have noticeable blank spots (trill). As it stands, a lot of these types don’t work in a lot of the purchased uniforms. Dstahl: This is an unfortunate side effect of how the complex character data was setup for Star Trek Online. At the time STO was made, it was designed in such a way that players would always be in uniforms and that the rest of the skin on the body would never be shown. Thus, when players demanded we show more skin around the time the first character outfits were released, we made a compromise with players on the forums at the time to blend the textures at the neck, because the skin on the rest of your body did not really exist up until that point. It wouldn’t be impossible to go back and remake all the skins, but it is a serious amount of time in order to retrofit all possible costume/skin combinations that up to this point has been too prohibitive to start. If our wonderful software engineers can come up with a software solution that helps the character artists address this, it may happen. As it stands, the compromise will continue as is for the foreseeable future. Q: (zerobang) Why do almost none of the new Missions reward Dilithium? Dstahl: We pay very close attention to the amount of Dilithium in the economy and how much Dilithium is acquired on a daily basis. For example, the average amount of Dilithium earned per day per player has been steadily increasing day over day since Season 6 released, without us adding Dilithium to any new mission rewards. We use this data as a way to determine how much Dilithium is needed in the economy at any given moment to help balance systems that depend on it such as the Fleet Advancement system. If we get to a point where the amount of Dilithium earned per player falls below expected levels, we will start adding new ways to earn it. If you are having trouble earning Dilithium, I suggest looking at the forums and wikis for ways to earn it in game. Or you can look here. Q: (maddinm214) When will we see the bonus rewards for testing Season 6 on Tribble? Dstahl: The expectation is that they will be out in either the next Thursday update or the one after. Q: (icegavel) It was mentioned when the Account bank came out that there would be account-bound items. What happened to this? Dstahl: We are in the process of converting thousands of specific items in the game to be account-bound and plan to release this change along with the ability to purchase account bank slots in August. We are also working on improving tooltip UI to clearly indicate the current bound state of items to help communicate this. Stay tuned for more information about how the new account binding rules work. Q: (bloctoad) If Federation is so wildly popular and Klingons such a tiny subset of the IP fanbase, then why was STO incapable of sustaining a subscription model based on the merits of Starfleet alone? Dstahl: STO could have maintained as a subscription only game, so the assumption is false. We still have a very healthy amount of subscribers. In fact, we added more lifetime subscriptions during last month’s sale than we expected. Free to Play is not only transforming the MMO industry, but growing it as well. Opinions may differ, but this game will continue to grow and the KDF faction will eventually grow as well. Q: (captainmarshal) When will we be able to fight Tholians in space? I’ve fought them in space on Tribble, but I haven’t seen them in space yet on Holodeck. Dstahl: Tholians will start showing up when the Starbase you are defending is big enough to draw their interest. When you queue up for a public event, the queue chooses a Starbase to defend at random from one of the people in the queue. In private queues, the Starbase is the queue owner’s Starbase. Q: (starcommando101) Will Starfleet Academy become a major part of the Tutorial? For instance, make the learning everything start and finish there. Then do battles in the Holodecks there, ground and space. Then learn about teamwork and using skill together. Cut the learning curve down. Dstahl: Both of the Academy maps were originally built for this specific purpose, but when we learned that we were going to convert the game to F2P, we did not have time to finish the new tutorials. Now that F2P is out and going strong, we plan to revisit this and evaluate the first levels of the game and how we teach new players about STO. You can expect this be addressed over the coming year. Q: (drogyn1701) Would you ever consider allowing Foundry authors to submit KDF missions to become “official content” with XP rewards in order to flesh out the KDF side and create 1-51 PvE level progression like the one Cryptic created for the Federation. Dstahl: This is one of the goals of developing our Foundry Spotlight feature. In addition to being able to flag specific missions for rewards, we also will be looking into the ability to “copy and freeze” specific Foundry missions so we can do exactly what you are describing. We will maintain the credits/tips for the author, while giving us a safe copy that isn’t subject to the author revising it further. Thank you for all of the great questions. Sorry if your question did not get answered, but you can rest assured that I do read the questions and even questions that don’t get answered to get flagged for the internal team to address. Thank you for continuing to make Ask Cryptic a useful feature for the game team.